Last week saw Navy researchers set a new world record with a test firing of a new 33 Megajoule railgun. Turns out NASA are also seriously considering a railgun to replace conventional rockets but in their case it would be 5x more powerful and two miles long. An early proposal has emerged that calls for a wedge-shaped aircraft with scramjets to be launched horizontally on an electrified track. 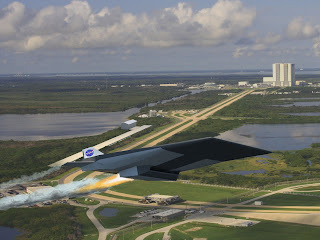 The aircraft would fly up to Mach 10, using the scramjets and wings to lift it to the upper reaches of the atmosphere where a small payload canister or capsule similar to a rocket's second stage would fire off the back of the aircraft and into orbit. The aircraft would come back and land on a runway by the launch site. "All of these are technology components that have already been developed or studied," NASA says. "We're just proposing to mature these technologies to a useful level, well past the level they've already been taken." For example, electric tracks catapult rollercoaster riders daily at theme parks. But those tracks call for speeds of a relatively modest 60 mph -- enough to thrill riders, but not nearly fast enough to launch something into space. The launcher would need to reach at least 10 times that speed over the course of two miles in Starr's proposal. The good news is that NASA and universities already have done significant research in the field, including small-scale tracks at NASA's Marshall Space Flight Center in Huntsville, Ala., and at Kennedy. The Navy also has designed a similar catapult system for its aircraft carriers. The EMALS Electromagnetic Aircraft Launch System, which uses a linear electromagnetic accelerator motor, will replace the current C-13 steam catapults in the new USS Gerald R. Ford (CVN-78) currently under construction. As far as the aircraft that would launch on the rail, there already are real-world tests for designers to draw on. The X-43A, or Hyper-X program, and X-51 have shown that scramjets will work and can achieve remarkable speeds. The USS Gerald R. Ford will finish off the era of the steam catapults and will inaugurate a launch system that could be used also as a missile launch, using less propellant.